I love fondue, anyway I can get it. 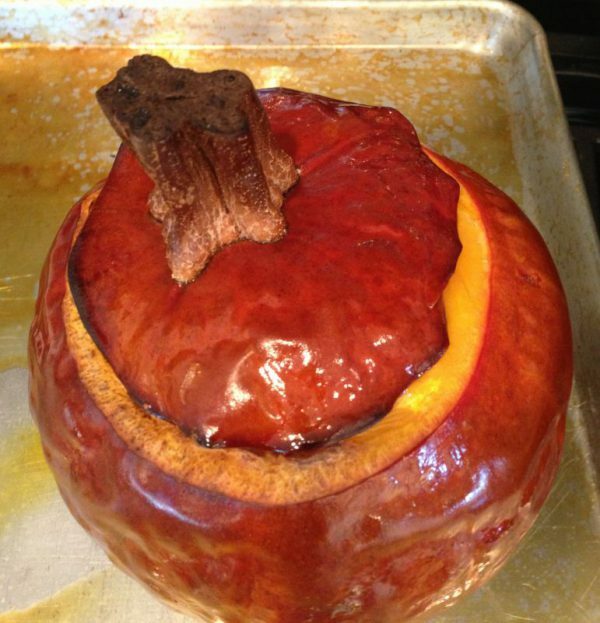 I work with sugar pumpkins all the time, and I was wondering if you can stuffed an entire pumpkin. So, I began looking at recipes and I was inspired when I read an issue of the Gourmet Holiday Magazine, and they stuffed a pumpkin with cheese for a fondue. I found this so intriguing I thought I would try it and use Greek cheeses instead. It took me awhile to decide what cheeses to use but I chose one hard and one soft cheese for the filling. It was such a beautiful presentation, I will make this again for Christmas but possibly change it up for the seasons. Try finding sugar pumpkins in your supermarket or visit a nearby farmer’s market and ask if they have any left at their farm. A fresh pumpkins should have bright orange flesh like this one. The stem should also be attached and hard. Clean out your pumpkin and make sure all the seeds and strings are removed before stuffing. This is how it looks when it comes out of the oven warm and gooey with a beautiful scent of pumpkin. Do not cook it ahead of time. (the cheese hardens). Plan ahead and place it in the oven so it’s ready when your guests arrive. Serve it up with freshly sliced baguettes or a strong cracker. I had a pretty appetizer knife alongside to scoop up the goodness. 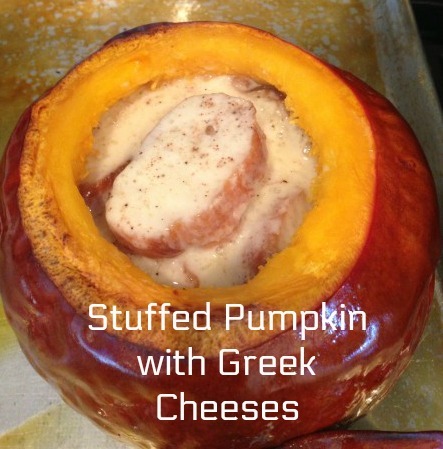 Inspired by Gourmet Magazine this stuffed pumpkin appetizer is a sure hit for your holiday table. It makes a knock-out presentation for your guests. I used Greek cheeses that are available at all cheese shops, or use cheeses of your choice. Toast the baguette slices on a cookie sheet in the oven until tops are crisp. Cool. Remove the top of the pumpkin using a sharp knife,cutting around the stem 3 inches in diameter.Set aside. 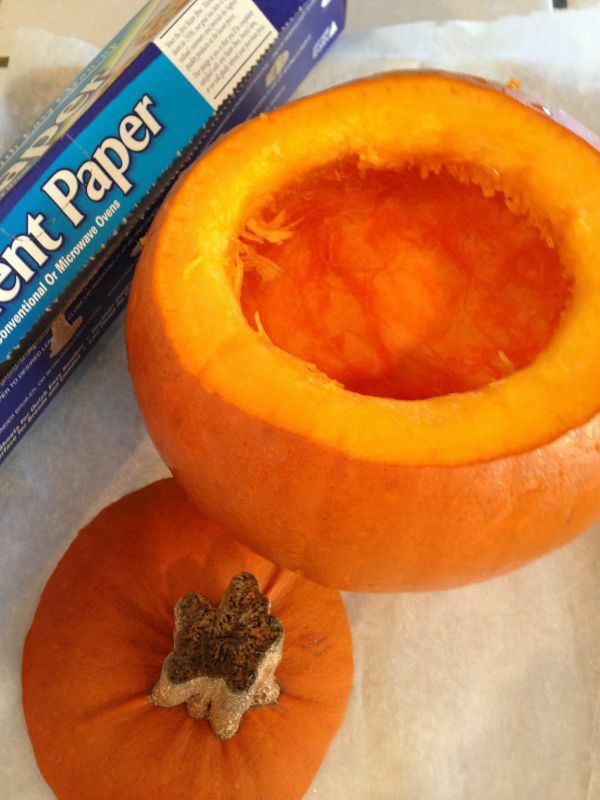 Scrape out the seeds and pulp with a spoon from the inside of the pumpkin. Season the inside of the pumpkin with ¼ teaspoon salt. Whisk together cream, broth,nutmeg,1/2 tsp. salt, and ¼ teaspoon pepper in a bowl. Cover with ½ cup of the cheese mixture. Add ¼ cup of the cream mixture. Cover the pumpkin with the top, and place on a parchment covered sheet pan. Bake until the pumpkin sides are tender and filling is puffed, 1-1½ hours. Remove from pan and place on serving platter with remainder baguette or crackers. The pumpkin can be stuffed 2 ours before baking and chilled. If the pumpkin gets cold, you can place it in the microwave or reheat it in the oven to reheat the pumpkin.